More than anything, the key to success, in any project, is focus. Maintaining emphasis on what you are attempting, creating, and/or selling is essential in manifesting one’s fully-realized vision. Without it the end result, to the observers and consumers, seems muddled and unsure of itself and, more importantly, what it’s trying to accomplish. 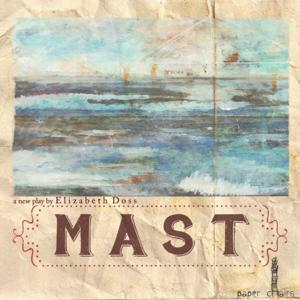 Mast, a new play by Paper Chairs co-founder Elizabeth Doss, suffers from this lack of focus, leaving the audience wondering what it was we were supposed to obtain from the experience. The new play, “[b]ased on the legacy of Doss’s own mid-century Texan relatives”, follows the lives of Ann (Katie Bender) and Walter (Jesse Bertron) as they conceive a child through a tryst on an airbase outside of Abilene, TX, taking them between the Texan countryside and the Dominican Republic during Raphael Trujillo’s (Noel Gaulin) dictatorial rule of the country, and through to the birth and maturation of their son, Michael (Sean Francis Moran). Most of my concerns with Mast stem from the production’s habit of wavering noticeably in tone and direction from scene to scene. The play travels from stock-standard scenes of impulsive love between two incompatible individuals, performed as customarily as one would expect from such a tale, to surreal scenes of plot development with an over-dependence on light and shadow effects (a particular scene late in the play involving a tornado comes to mind), and even manages to fit in an unexpected song or two along the way. With such a bulk of variety within a 90-minute production, much of the plot development feels rushed, thereby robbing the scenes of their emotional weight. The shifts in tone are jarring; as soon as we begin to settle into the mood of the production we are promptly thrown into a scenario, out-of-synch with what we just witnessed, via visual storytelling gimmick, transitional bass music, or unforeseen song sequence. Design-wise, the production was decent. The set and lighting designers (Lisa Laratta and Natalie George respectively) functioned well together in creating a mostly aquatic feel, working off of the “lost at sea” theme throughout the play, leaving room for warm light to emphasize intense beats in the show. Transitions were typically accompanied by the aforementioned, live, ambient bass music, which, while not always fitting the previous scene’s mood, maintained that same, drifting, lost sensation captured by Laratta and George’s designs. However, one seriously questionable design choice comes from the subtitle screen. A healthy chunk of Mast’s dialogue is in Spanish, but the screen upon which the English translations are projected is high above the front row, compelling anyone in the first three rows to tilt their heads back to read the conversation, effectively severing their visual connection, and their immersion, with the action onstage. The casts’ acting wavered with the tone of the production. Lead actors, Bender and Betron, had a strong understanding of their characters, but did not seem to act off one another well. Expectedly, they each felt stronger in Act II, in which they are not onstage with one another as often as they are in Act I. Moran had the toughest job of playing the same character from his infancy/childhood in the Dominican Republic through to adulthood, preparing to join the military, but he never seemed comfortable in the childish roles. Noticeably, Moran, physically, is of a decent build, whereas his character is often mentioned to be too skinny for his age, often refusing to eat, and akin to a daddy longlegs. Among the entire cast, Tiffany Nicely-Williams (Uranita/Loretta) had the strongest grasp of her characters, communicating comfortably with others onstage, and maintaining the audiences’ sympathies; my only disappointment with her is the haste with which the script abandons her after she is introduced. The chief inconsistency with the production came with the uncertainty of whether or not what we were watching was supposed to be humorous or not. Incidents involving the purposefully noticeable use of human-made sound effects/props (i.e. using a toy plane to simulate a military aircraft flying above, and ending a decent shadow-effect on the scrim, depicting seafaring vessels sailing, by showing the shadow of the man holding the ship prop) were obviously played for laughs, while most of the play attempted to play it serious. The indeterminable humor was most notable during Trujillo’s scenes, Gaulin playing the role of the obviously dangerous individual who floats between being jovial and threatening constantly. In other shows, this is typically used to create a sense of risk with an individual, making the characters, and audience, wary of the individual’s motivations and desires. However, Trujillo was not enough of a constant presence onstage to make that caution palpable. Somewhere within Mast is a story I want to see performed onstage, but as it is the production feels, in a thematically fitting sense, lost at sea. Paper Chair’s Mast continues playing at Salvage Vanguard Theater every Thursday, Friday, and Saturday evening at 8pmuntil August 8th.